When looking for the cheapest flight prices, don't focus only on the low cost carriers, BA & SAA (British Airways and South African Airways) are the cheapest from Durban to Johannesburg in today's flight survey. * flights leave DUR for JNB/HLA between 1729 & 2031 on the 18th Sep 2009 (prices change). Prices will change. ** This is the cheapest British Airways flight we have ever surveyed from Durban to Johannesburg since the R410 on 12 Jan 2008. BA flight 6212 could have been booked on the Kulula website as MN6212, but for R268 more (see South Africa cheap flights for tips on cheap flights). *** This is the cheapest Kulula flight from Durban to Joburg in our surveys since the R489 Kulula on 9 Aug 2008. Next week we'll look at flight prices in the school holiday, which start on the 24th September. At the same time the ICC Champions Trophy kicks off, so be careful of higher prices than usual for flights during that period. 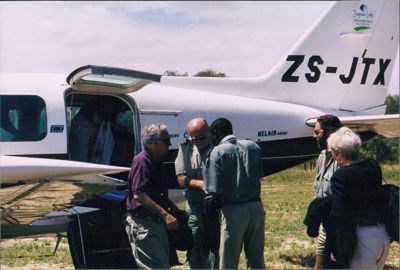 After catching a charter flight to Sabi, Sheila drove to Chitwa Chitwa Private Game Lodge, where she was hoping to see a leopard (the only of the big 5 she hadn't yet set her eyes on). And leopards she saw a plenty of - which is not surprising, since the Sabi Sands Reserve is the best spot in Africa to see leopards (they're used to the vehicles). "Many, many Hostie's, most of them in fact, fight their weight all the time. We've all had a dabble with slimming pills purchased in South Africa where they are legal. They are amphetamine based, just like that old clubbing favourite 'Speed', and someone is always bringing a supply in that sell like hot cakes." from the book "You F'Coffee Sir!". Buy your travel books at Exclusive Books South Africa.